Become a motor cross champion and shoot for the checkered flag. Guide your bike through caves, caverns and secret tunnels. Navigate over rubble, slopes and hillsides. Watch out for cliffs and ledges! The rugged landscape can be perilous and unforgiving. Collect as many bonuses as you can, just don't crash and burn off the mountainside. Easy gameplay and multiple levels provide hours of entertainment. 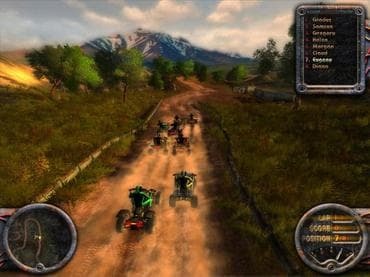 Combining realistic graphics and a heart-pounding soundtrack, this racing game is for extreme bikers only. Download this free game today and become a world-class thrill seeker. If you have questions about ATV Quadro Racing game, please contact us using this form.